"why don't you do a Masters?" fully expecting to be fielded by an administrator. "why don't you pop in now, seeing you're just around the corner"
and where do i turn to source the materials for this work? and where did i first meet Marion [the Supreme Bird who manages that magical resource]? my students will know i have a passion for it...but how to fit the thick stuff through a machine? easy. i talk to my friend Marion and make bleating noises about "wouldn't it be lovely if my favourite thread were available thinner"
most things seem to happen for a reason huh? and when your universe is on collision course with all the other good universes out there, magic and beauty happen... and where in heavens name, would a whole damn lot of us be if YOUR universe hadnt collided with the others and then ours??? well, it all seems that when you are striving and learning and moving forward with sound and good work and principles, and a dollop of love in there (because who knows how the love works in it all?) it sometimes seems to come together, as it has been doing (YOU know) for me too this last little while. in a non-corporate thinking world, goodness can move forward. and goodness abounds in those lovely amazing garments. i imagine dancing in them myself! Thank you for sharing this. 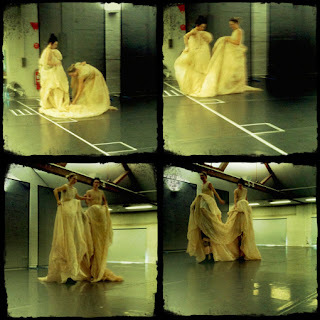 The dresses are gorgeous and its thrilling to learn how it came together. What a wonderful collaboration you have established with Mr. Warren. Sometimes it just takes that one gutsy move and everything falls into place. If it is meant to. Wish I could see the production. I know this is off topic but i am trying to dye a linen/cotton shirt for my friends husband and was wondering if you have any tricks for pre-mordanting this mix? Ha yes i know you've said it before... Just was wondering if it changed anything with the mix of the two fibres. I will get to cleaning out the fireplace now, a good excuse to do something i've been putting off..
Those dresses are beautiful! You may like to know that 'your' poem is going to be in my first collection coming out in the autumn. I've read it at a festival and people loved it, so maybe they will follow up and find out more about your work. oh there it is ! . . in white. . . this looks absolutely stunning do you have pictures from the performance ?